Having a big Sunday lunch with your family, where everyone brings a dish or a bottle of wine, is a great tradition that needs to stay. There’s no better way to end a hectic week than good people, good conversation, and of course, great food. 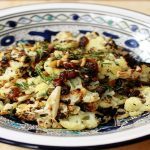 If you happen to be the host, you’ll be expected to make the main course, and trying to find something that tastes delicious and is big enough to feed a crowd is no easy feat. 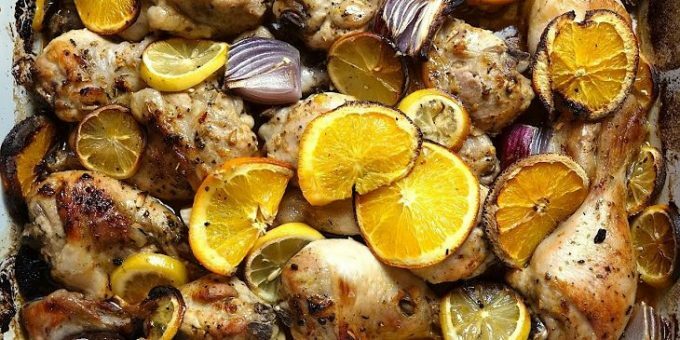 Thankfully, this is where this oven roasted citrus chicken recipe comes into play. 1. Preheat the oven to 220C/430F. 2. Into a jug, add the olive oil, the garlic, the orange juice, the lemon juice, the sugar, the mixed dry herbs, the paprika, the dried chili flakes, and salt and pepper. Give the mixture a good stir. 3. Place your chicken drumsticks into a large oven-proof roasting dish. Pour your freshly-made marinade over the chicken pieces. Using a pair of tongs, turn each piece of chicken over, so that they are all completely covered in the marinade. 4. Take your quartered red onions and stuff them into the gaps between the chicken. Then, take the orange and lemon pieces and arrange them on top of the chicken. Season with some more salt and pepper. 5. Place in the oven for 1 hour, or until the chicken is cooked and the juices run clear.